Who knew you could go play in the sand without getting wet? 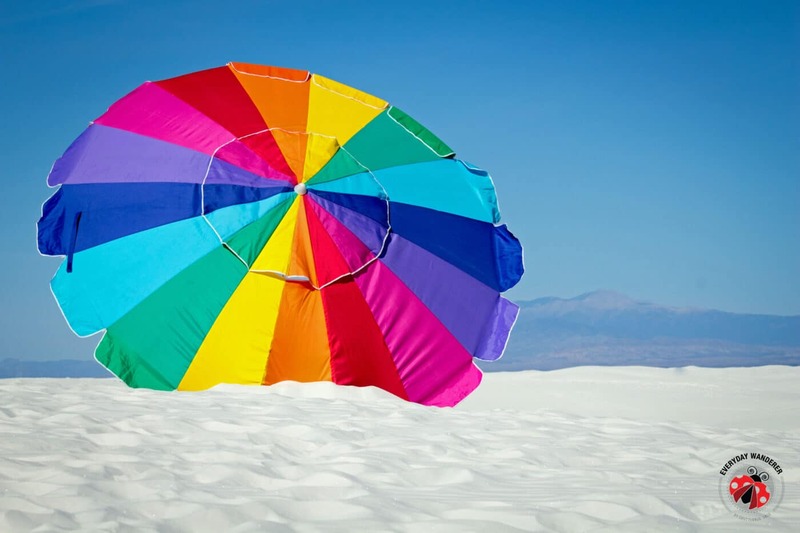 White Sands National Monument makes it possible to play in the sand without getting wet. These massive white dunes are located in southern New Mexico. 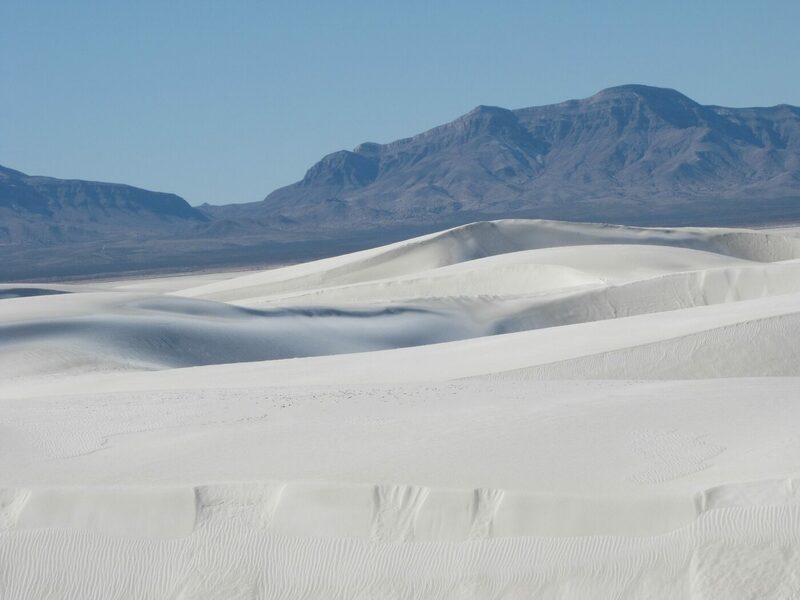 These dunes are unique because they are made of white gypsum sands. The dunes might look peaceful but they are active and full of life. 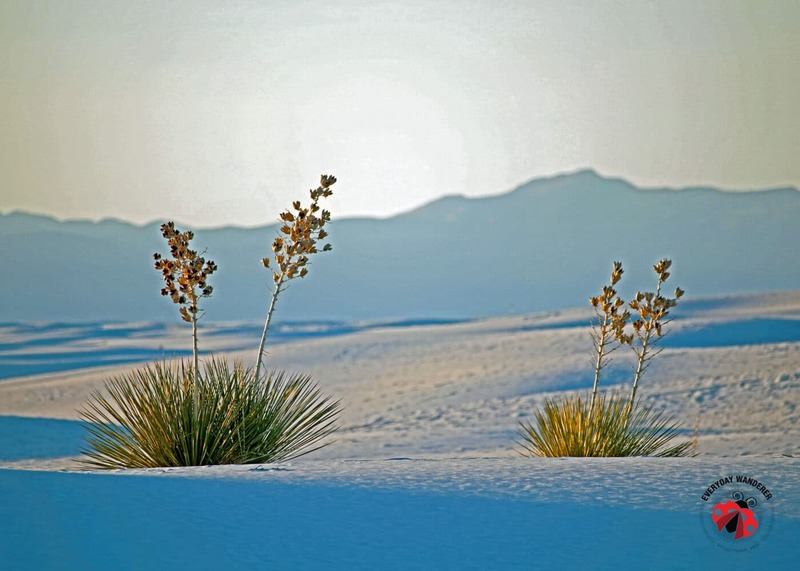 Located in the northern Chihuahuan Desert near Alamogordo, New Mexico, White Sands National Monument is home to 275 square miles of white sand dunes. 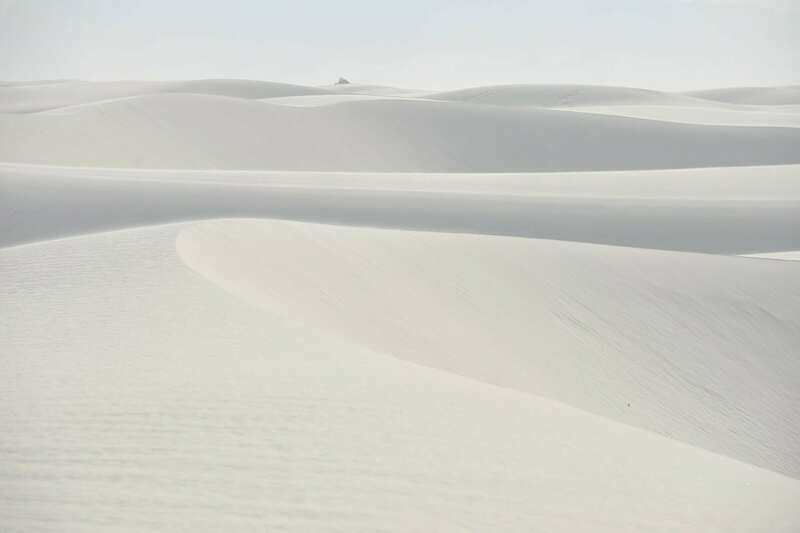 This natural wonder of the world is the largest gypsum dunefield on the planet and was designated as a national monument in 1933 via presidential proclamation. Today, White Sands is New Mexico’s most popular National Park Service site, welcoming approximately 500,000 visitors each year. 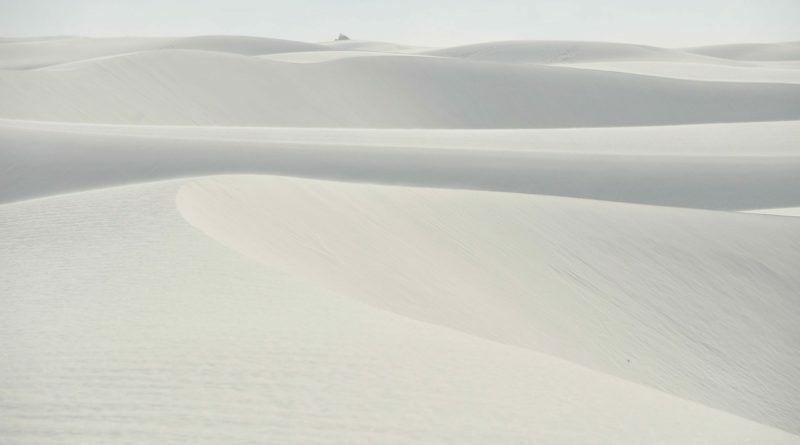 Pro Tip: If you want to avoid the crowds, visit White Sands National Monument in January when crowds are the smallest. There is only one entrance to White Sands National Monument along US-70. When the White Sands Missile range is performing a missile test, the highway is occasionally closed to traffic. Depending upon the specifics of the test, all or portions of White Sands may also be closed. These road closures can last up to three hours, so plan ahead by visiting the army website or calling 575.678.1178. No one wants to spend a day at White Sands stuck on the highway for three hours! 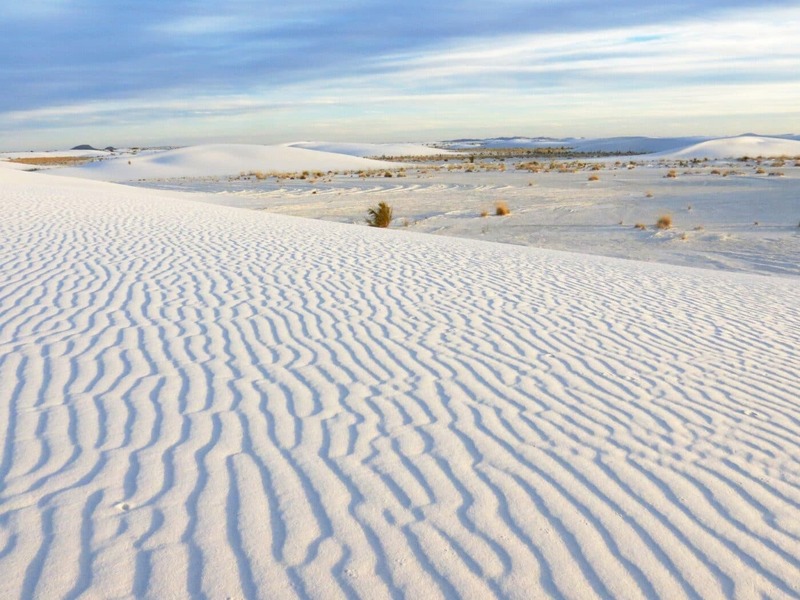 There is no public transport to the White Sands National Monument. 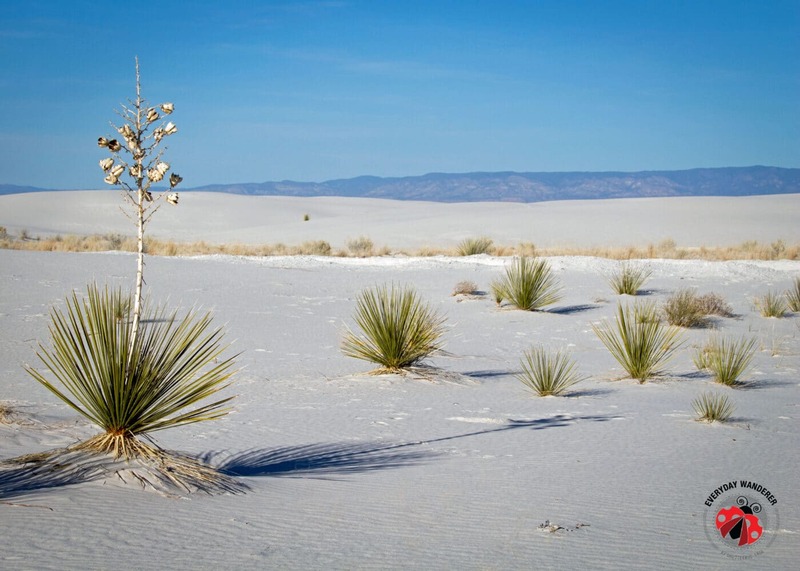 Adventure seekers should consider camping at one of the ten backcountry campsites at White Sands National Monument. 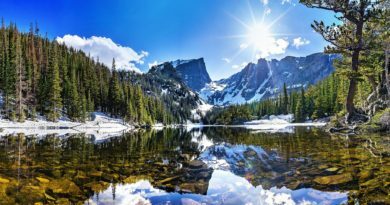 Backcountry camping is the most primitive form of camping, and you must be well-prepared to ensure a successful experience. 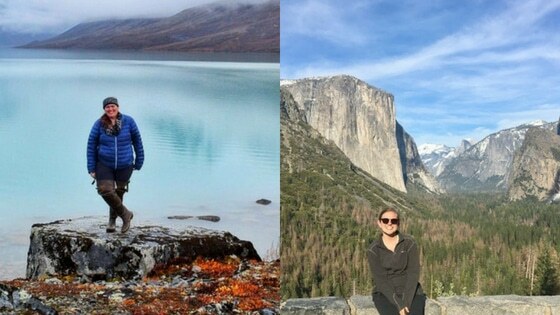 These campsites offer no amenities. That means there is no shelter, shade, picnic table, or water. You’ll need to ensure you carry adequate water and be mindful of the arid desert conditions. The nearest restroom facility is a vault toilet a one-mile trudge through the steep, shifting white sand dunes back at the beginning of the trailhead. There are no shower facilities at White Sands National Monument. If you decide to camp at White Sands, you should be at your campsite by dusk and prepared to stay put until dawn. If you aren’t lucky enough to score a campsite — or you just really like running water and indoor plumbing — stay in either Alamogordo or Las Cruces, New Mexico. A 20 minute drive northeast of White Sands, Alamogordo has a population of 30,000 and offers a range of national chain and local accommodations. About an hour southwest of White Sands is the larger community of Las Cruces. With a population of more than 100,000 there is a wider range of lodging options in Las Cruces. 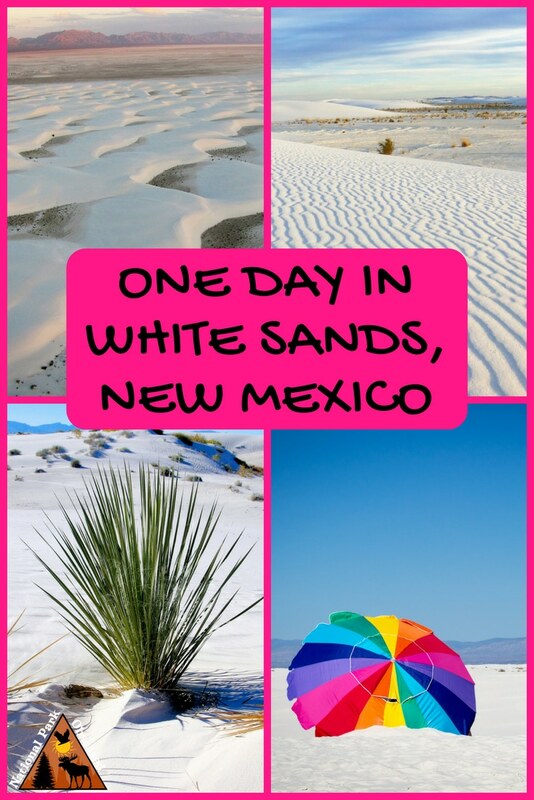 White Sands opens daily at 7:00 am every day of the year except Christmas (December 25). Closing hours adjust seasonally with sunset. You can find detailed hours of operation on the White Sands National Monument website. The adobe pueblo building at the entrance of the White Sands National Monument is a great first stop. Here you can grab information on daily events, refill your water bottle*, and explore the interactive museum. This is also the place to watch “A Land in Motion,” a fantastic 17-minute film about White Sands and the creatures that call it home. * There is no water available anywhere inside White Sands National Monument once you leave the Visitors Center, so do NOT skip this step! Pro Tip: If you have a National Park Passport the White Sands Visitor Center is where you can get it stamped. 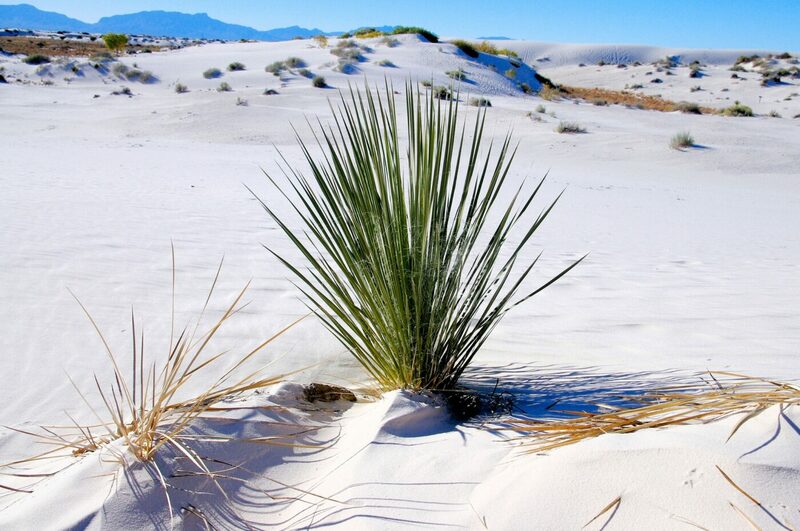 Pro Tip: Be sure to check out special, seasonal ranger-led activities when you visit White Sands. 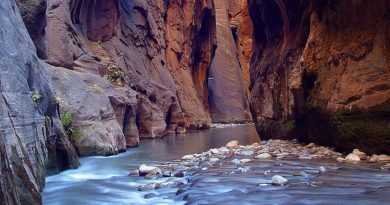 These include additional adventures like the full moon hike, Lake Lucero Tour, or sunrise photography walk. 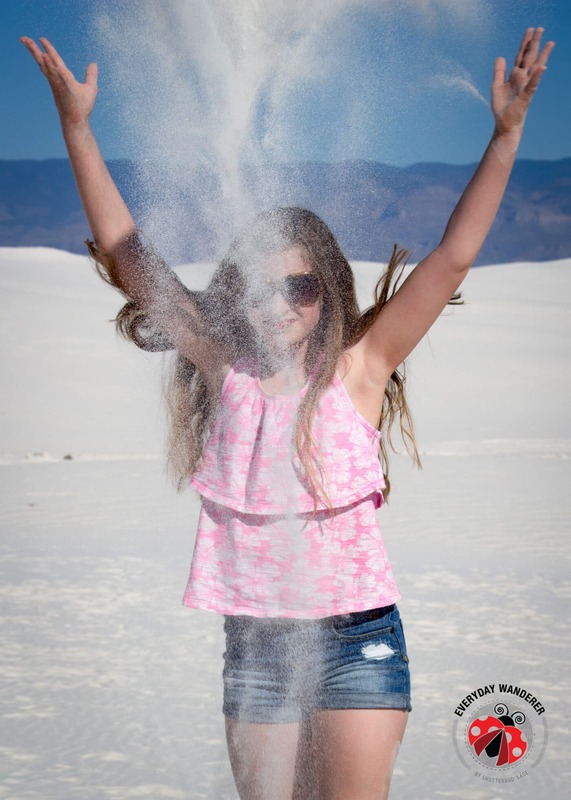 If you visit White Sands with children, pick up an Adventure Pack at the Visitors Center. They are available on a first come, first served basis and include binoculars, an animal track guide, compass, and a bunch of other goodies that make exploring and learning about White Sands fun. When you’re done with the Adventure Pack return it to the Visitors Center. Pro Tip: While you’re at the Visitors Center, have your child inquire about White Sands’ free Junior Ranger program. Learn more about the plants native to the Chihuahuan Desert by taking a free, self-guided tour of the Native Plant Garden just outside the White Sands Visitor Center. There’s nothing quite like the desert in the spring, when wildflowers and yucca are in bloom, but the plant garden is pretty and full of color anytime between mid-March and November. Pro Tip: To experience the Native Plant Garden from anywhere in the world, download the White Sands Chihuahuan Desert Native Plant Garden FIeld Journal or listen to the 23-minute Audio Tour. When you’ve finished at the VIsitors Center, jump on Dunes Drive to take a scenic, eight-mile (13 km) tour through the heart of the gypsum dunes. 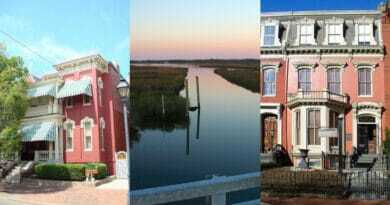 It takes about 45 minutes to complete the entire drive, but you may want to allow additional time to explore exhibits, walk or play in the sand, and take photographs. In addition to exploring the white gypsum sand dunes “freestyle,” you can also walk the boardwalk or hike one of four trails. Interdune Boardwalk. At a minimum, take 20-30 minutes to complete the is a half-mile (650m) stroll through the dunes. The experience will include signs explaining the geology, plants, and animals of White Sands. Pro Tip: Before you set out on one of the trails, be sure you have plenty of water and these additional important items. The texture of pure, gypsum sand is like no other sand you’ll ever experience. The fine, powder-soft texture is mesmerizing to sift through your fingers and fun to dig. If you’re like me and love to sled, but hate the cold, sledding at White Sands is the perfect solution! But because gypsum sand isn’t slippery like snow, you will need to wax up your ride. If you headed to the Chihuahuan Desert and forget to pack a snow sled, don’t worry! Sleds and blocks of wax are available in the White Sands Visitor Center. Your visit to White Sands will go quickly, and before you know it, you’ll be hungry. There are more than 60 covered picnic tables along Dunes Drive. Each site includes a grill and is available on a first come, first served basis. When enjoying your meal outdoors at White Sands, remember to clean up after yourself and leave no trace. 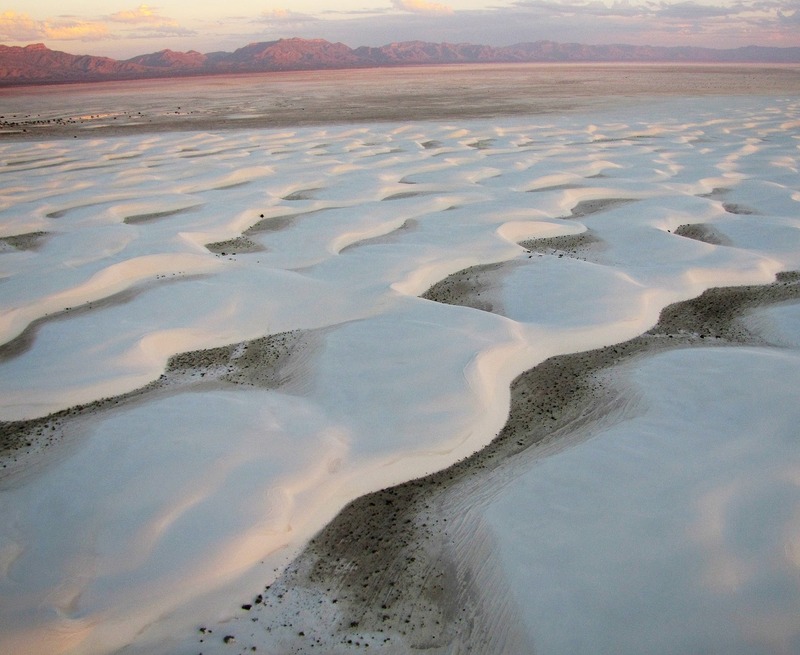 If you’re looking for an Instagram-worthy destination, White Sands should be at the top of your list! But the lightweight, blowing sand can present unique challenges. Try to store your camera and phone when you’re not actively taking photos to reduce the amount of sand that ends up in your buttons, dials, and on your lens. How Do You Plan on Spending Your Day at White Sands?